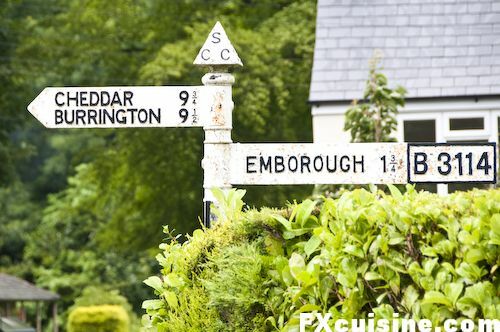 In August I went to visit a few of the best cheesemakers in England. For my last article in 2008, I'll take you for a visit of the farm and a tasting of the product. 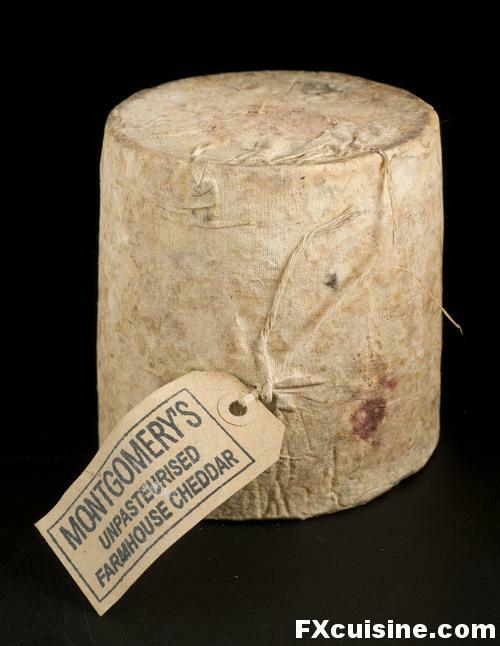 Click above for a video of my tasting Montgomery's 18-month-old Cheddar (with some help from Sir Arthur Conan Doyle who wrote Lord of the Mites) or download Flash Player if needed or click for HD version. ... until they reach North Cadbury. 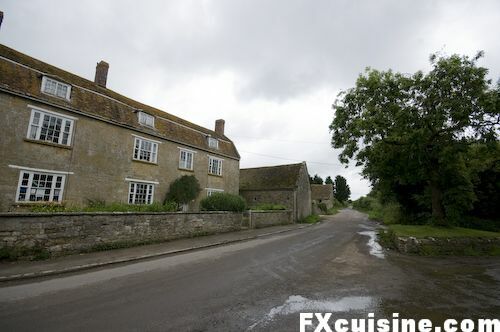 Stop at Manor Farm, the home of Montgomery's Cheddar. 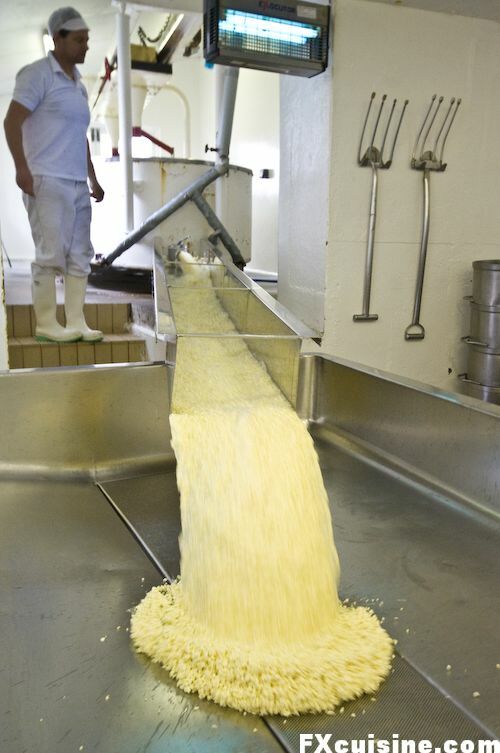 For James Montgomery might well make the best cheddar since King Arthur. 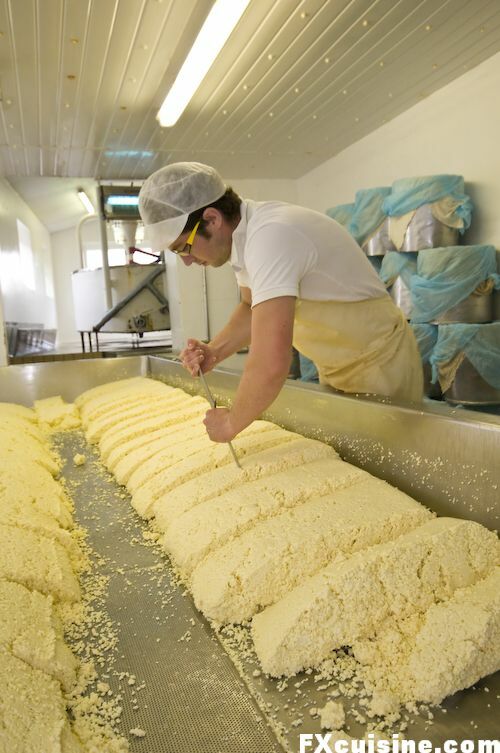 With his neighor Keen's, his farm is the best of only 9 farmhouse cheddar makers left in Britain. All the rest is industrial crap, the sort of cheese you use to patch some holes in your tires. But Montgomery, oh, he is serious about his cheese. His family has been working this farm for the last century and all his cheese is from unpasteurized milk from the farm's own herd, which grazes over what scholars consider the most likely location for King Arthur's castle Camelot - the fort of South Cadbury. 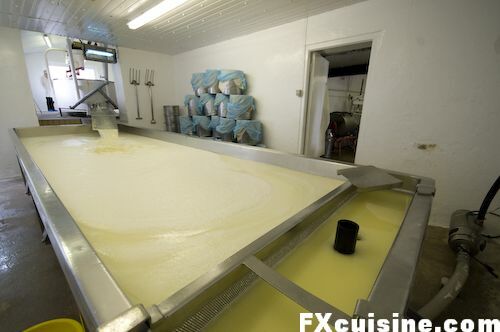 See the huge 1000 gallons vat where the milk is quietly simmering while the lactic ferments work their magic. 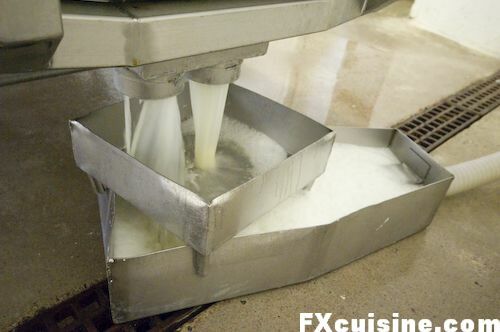 As I entered the farm, the milk was already in the vats with the two electrical stirrers slowly moving back and forth and back and forth. A deliciously sweet milk smell filled the room. I just had time to shoot a panoramic picture before the cheesemakers came back. ... while his younger colleague made sure all the curdle went down. ... and drips furiously into a separate system. 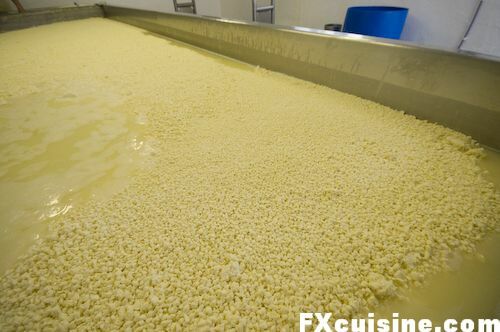 ... as the cheesemakers quickly set out to work the curds. ... which are piled up to drain them of the whey. ... and tests its acidity. 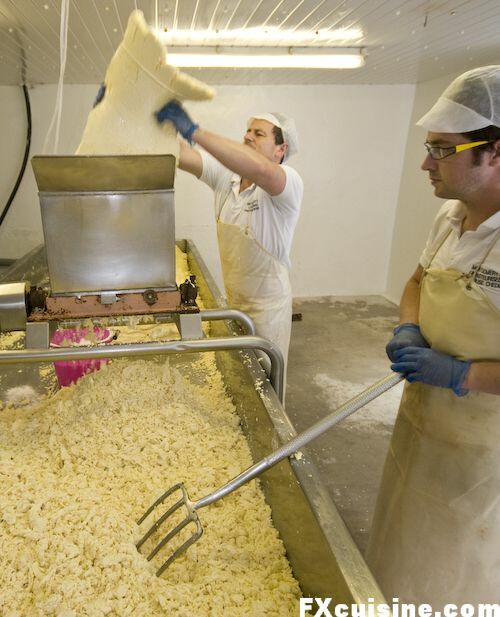 Steven has been making cheese for 29 years, the last 14 at Montgomery's. He lives in Glastonbury, which sounds like a thrilling place, but he is not thrilled. In Glasbtonbury, every decent shop over the years has been replaced by some dress-as-Merlin or be-a-sorcerer shop where you can buy all sorts of gadgets to play Lord of the Rings. 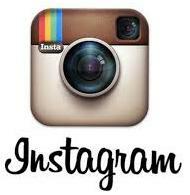 For the locals that's not so good. We get all sorts of tourists, some of them come to Glastonbury because they think the end of the world has come or that they can be witches. Many are on the dole. 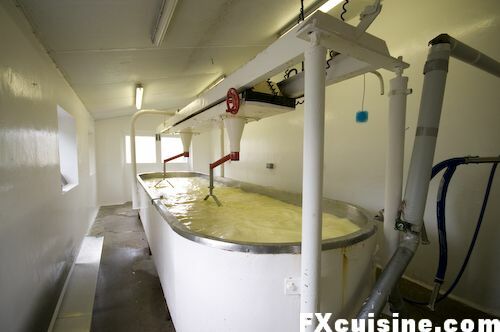 Go into the shredder and leave as cheddarized curds while the second cheesemaker uses his pitchfork to toss the curds. ... while I watch in awe those century-old gestures.